The days were short and cold, the wind whistled sharply, but there was no snow. Cold rains were falling. Day after day the rain fell, pattering on the roof and pouring from the eaves. Mary and Laura stayed close by the fire, sewing their nine-patch quilt blocks, or cutting paper dolls from scraps of wrapping paper, and hearing the wet sound of the rain. Every night was so cold that they expected to see snow the next morning, but in the morning they saw only sad wet grass. They pressed their noses against the squares of glass in the windows that Pa had made and they were glad they could see out. But they wishes they could see snow. 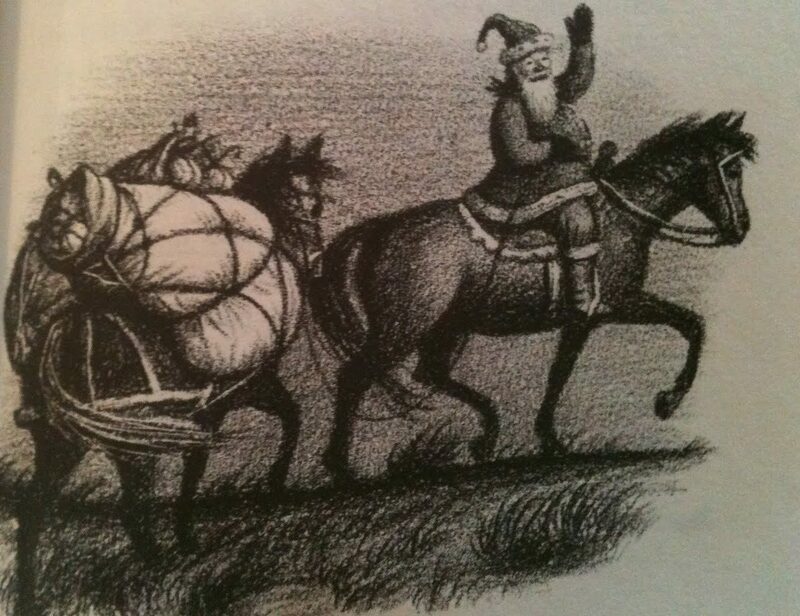 Laura was anxious because Christmas was near, and Santa Claus and his reindeer could not travel without snow. 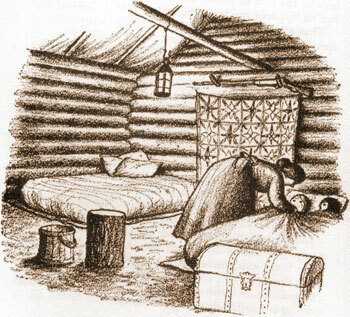 Mary was afraid that, even if it snowed, Santa Claus could not find them so far away in Indian Territory. When they asked Ma about this, she said she didn’t know. “What day is it?” they asked her anxiously. “How many more days till Christmas?” And they counted off the days on their fingers, till there was only one more day left. Just before noon the light changed. The clouds broke and drifted apart, shining white in a clear blue sky. The sun shone, the birds sang, and thousands of drops of water sparkled on the grasses. But when Ma opened the door to let in the fresh, cold, air, they heard the creek roaring. They had not thought about the creek. Now they knew they would have no Christmas, because Santa Claus could not cross that roaring creek. She said yes, she could. But she was sober. Then Mary asked him if the creek was going down, and he said it was still rising. Ma said it was too bad. She hated to think of Mr. Edwards eating his bachelor cooking all alone on Christmas day. Mr. Edwards had been asked to eat Christmas dinner with them, but Pa shook his head and said a man would risk his neck, trying to cross that creek now. Of course, that meant that Santa Claus could not come either. Laura and Mary tried not to mind too much. They watched Ma dress the wild turkey, and it was a very fat turkey. They were lucky little girls to have a good house to live in, and a warm fire to sit by, and such a turkey for their Christmas dinner. Ma said so, and it was true. Ma said it was too bad that Santa Claus couldn’t come this year, but they were such good girls that he hadn’t forgotten them; he would surely come next year. Still, they were not happy. After supper that night they washed their hands and faces, buttoned their red-flannel nightgowns, tied their nightcap strings, and soberly said their prayers. They lay down in bed and pulled the covers up. It did not seem at all like Christmas time. Laura’s heart jumped. But then she thought again of the creek and she knew nothing could happen. Ma took one of Mary’s clean stockings, and one of Laura’s, and she hung them from the mantel shelf, on either side of the fireplace. Laura and Mary watched her over the edge of their bed covers. She sat down again by the fire and Laura almost went to sleep. She woke up a little when she heard Pa say, “You’ve only made it worse, Caroline.” And she thought she heard Ma say: “No, Charles. There’s the white sugar.” But perhaps she was dreaming. Then she heard Jack growl savagely. The door-latch rattled and someone said, ‘Ingalls! 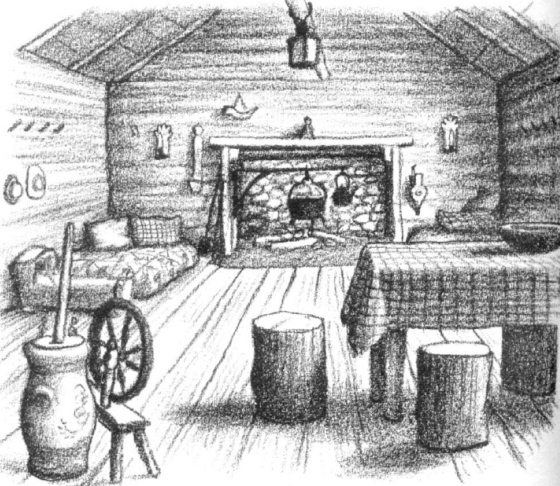 Ingalls!’ Pa was stirring up the fire, and when he opened the door Laura saw that it was morning. The outdoors was gray. “Great fishhooks, Edwards! Come in, man! What’s happened?” Pa exclaimed. Laura saw the stockings limply dangling, and she scrooged her shut eyes into the pillow. She heard Pa piling wood on the fire, and she heard Mr. Edwards say he had carried his clothes on his head when he swam the creek. His teeth rattled and his voice shivered. He would be all right, he said, as soon as he got warm. Laura sat up straight in bed. “Did you see Santa Claus?” she shouted. “I sure did,” Mr. Edwards said. “Wait, wait a minute!” Mr. Edwards laughed. And Ma said she would put the presents in the stockings, as Santa Claus intended. She said they mustn’t look. Mr. Edward came and sat on the floor by their bed, and he answered every question they asked him They honestly tried not to look at Ma, and they didn’t quite see what she was doing. When he saw the creek rising, Mr Edwards said, he had known Santa Claus could not get across it. (“But you crossed it,” Laura said. “Yes,” Mr. Edwards replied, “but Santa Claus is too old and fat. He couldn’t make it, where a long, lean razor back like me could do so.”) And Mr. Edwards reasoned that if Santa Claus couldn’t cross the creek, likely he would come no farther south than Independence. Why should he come forty miles across the prairie, only to be turned back? Of course he wouldn’t do that! So Santa Claus said, “Hello, Edwards! Last time I saw you were sleeping on a corn shuck bed in Tennessee.” And Mr. Edwards well remembered the little pair of red yard mittens that Santa Claus had left for him that time. “I’ll do that, and with pleasure,” Mr. Edwards told him. Then he shook hands with Mr. Edwards, and he swung up on his fine bay horse. Santa Claus rode well, for a man of his weight and build. And he tucked his long, white whiskers under his bandana. “So long, Edwards,” he said, and he rode away on the Fort Dodge trail, leading his pack mule and whistling. These new tin cups were their very own. Now they each had a cup to drink out of. Laura jumped up and down and shouted and laughed. But Mary stood still and looked with shining eyes at her own tin cup. Then they plunged their hands into the stockings again. And they pulled out two long, long sticks of candy. It was peppermint candy, striped red and white. They looked and looked at that beautiful candy, and Laura licked her stick, just one lick. But Mary was not so greedy. She didn’t take even one lick of her stick. The cakes were too pretty to eat. Mary and Laura just look at them. But at last Laura turned hers over, and she nibbled a tiny nibble from underneath, where it wouldn’t show. And the inside of that little cake was white! Laura and Mary never would have looked in their stockings again. The cups and the cakes and the candy were almost too much.They were too happy to speak. But Ma asked if they were sure the stockings were empty. They had never even thought of such a thing as having a penny. Think of having a whole penny for your very own. Think of having a cup, and a cake, and a stick of candy, and a penny. “Oh, thank you, Mr. Edwards! Thank you!” they said, and they meant it with all of their hearts. Pa shook Mr. Edwards’ hand, too, and shook it again. Pa and Ma and Mr. Edwards acted as if they were almost crying. Laura didn’t know why. So she gazed again at her beautiful presents. She looked up again when Ma gasped. And Mr. Edwards was taking sweet potatoes out of his pockets. 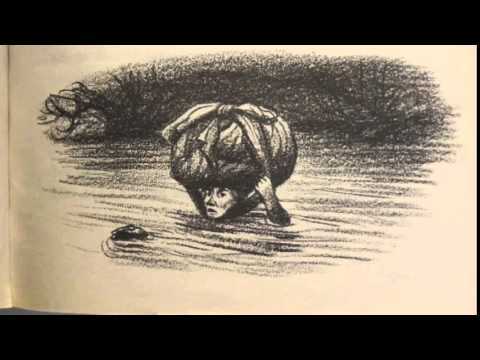 He said they had helped to balance the package on his head when he swam across the creek. He thought Pa and Ma might like them, with the Christmas turkey. There were nine sweet potatoes. Mr. Edwards had brought them all the way from town, too. It was just too much. Pa said so. “It’s too much, Edwards,” he said. They never could thank him enough. Mary and Laura were too much excited to eat breakfast. They drank the milk from their shining new cups, but they could not swallow the rabbit stew and the cornmeal mush. “Don’t make them, Charles,” Ma said. “It will soon be dinnertime. For Christmas dinner there was the tender, juicy, roasted turkey. There were the sweet potatoes, baked in the ashes and carefully wiped so that you could eat the good skins, too. There was a loaf of salt-rising bread made from the last of the white flour. And after all that there were stewed dried blackberries and little cakes. But these little cakes were made with brown sugar and they did not have white sugar sprinkled over their tops. Then Pa and Ma and Mr. Edwards sat by the fire and talked about Christmas times in Tennessee and up north in the Big Woods. But Mary and Laura looked at their beautiful cakes and played with their pennies and drank water out of their new cups. And little by little they licked and sucked their sticks of candy, till each stick was sharp pointed on one end. That was a happy Christmas. They are wonderful books! I first got them at the library, and later had my own copies, as did my daughter. Some I have had to replace because they just wore out. 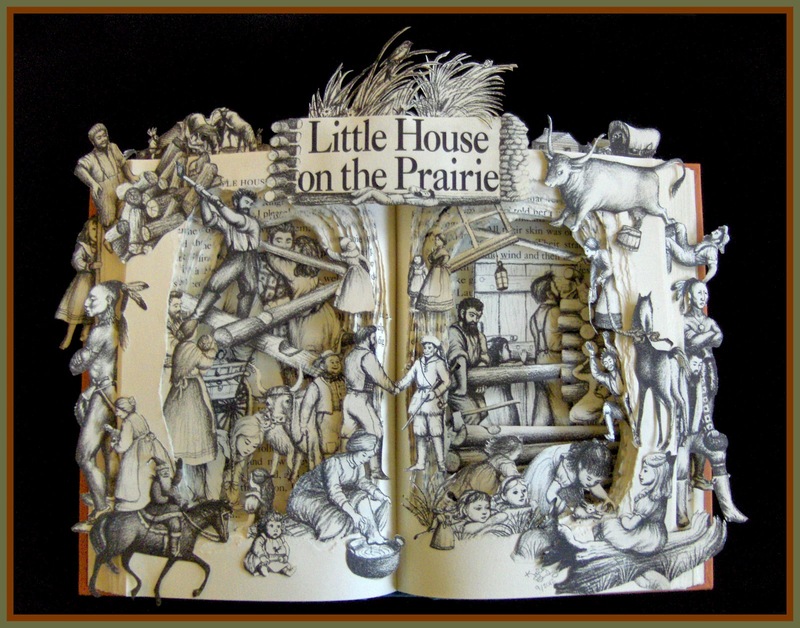 By the way, did you hear that Laura Ingalls Wilder has become a PC victim? An award that once bore her name has now been stripped of it, and some festivals etc have removed her name. Why? Apparently her remarks and portrayal of the Indians. MORE PC stupidity. If their skins were any thinner, their guts would fall out. Do you know if it is true (I can’t remember where I read it) that Laura quit writing in protest over the high taxes that she had to pay? I read all her books, when I was a kid. Watched all of Little House on the TV, too. May have related this, too, but my firefighter/EMS uncle with all his biker friends used to sit and watch the show, while smoking joints, and they had to quit watching it, because it made them all cry. For crying out loud, they’re bikers. We’re talking Harley-Davidsons and tattoos, and bad-a$$ness. They all said nope. We’re not watching Little House any more. This is one of the funniest stories I’ve ever heard. Little House made every single one of those Bada&&es blubber and cry. That’s so cool. I think they switched to watching COPS instead. Wonderful story. I watched all the Little House episodes, probably many times. I also read several books, but not all of them.